Jesus on Sinai | Theopolis Institute | Bible. Liturgy. Culture. 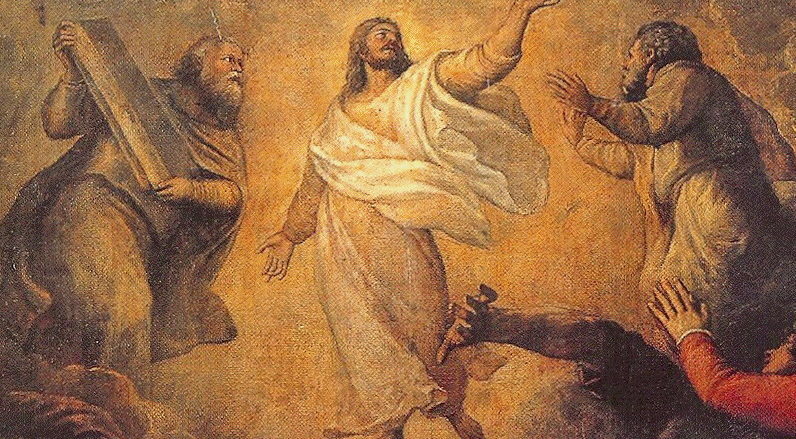 Among the many allusions in the transfiguration story, one allusion, or rather, one group of allusions, is especially prominent — allusions to Mt. Sinai. The first and least obvious of the allusions to Mt. Sinai is the expression “high mountain” in Matthew and Mark and “the mountain” in Luke. Ancient commentators do not approach these expressions like modern commentators do. Modern commentators calculate which mountains Jesus might have gone to that are within a six-day journey from Caesarea Philippi. For some reason, we moderns do not ask the question, “why is the mountain not named?” Ancient commentators ignore the geography and consider the symbolic meaning of the mountain, though in my superficial search I have not found one that picked up the Biblical allusion. I believe the reason the evangelists leave the mountain unnamed is in oder to prevent us from being distracted by geography. They want us instead to think of Biblical history. The unnamed mountain’s location and topography is not important. What is important is who did what with respect to the mountain. We read that Jesus led His three closest disciples up a mountain. It is this that is important, and when we focus on this, we are led in the right direction — which has nothing to do with physical geography. Where are we led? We are supposed to consider other stories of a spiritual leader guiding his followers up a high mountain. Of course, there is more, but that is the start of the story, so we can start there. When we do, we will remember a story from the ancient past, when Moses led Aaron, Nadab, and Abihu up a mountain. If this connection does not seem to be clear, remember that in all the Bible there are very few stories about a great spiritual leader who takes three close assistants up a tall mountain with him. To be specific, there are only two — the story of Moses with Aaron, Nadab, and Abihu, and the story of Jesus with Peter, James, and John. Thus, by not naming the mountain — which was certainly not Mt. Sinai — the evangelists allow us or even lead us to make the connection between Jesus and Moses. The unnamed mountain is “spiritually” Mt. Sinai, or, in Peter’s words, “the holy mountain” (2 Peter 1:18; cf. Psalm 48:1; Isaiah 11:9; 56:7; 57:13; 65:11, 25; 66:20; Ezekiel 20:40; 28:14; Daniel9:16, 20; 11:45; Joel 2:1; 3:17; Obadiah 1:16; Zephaniah 3:11; Zechariah 8:3). Even if there were no other allusions to the story of Sinai, I think that the mountain being unnamed and Jesus leading three prominent disciples up the mountain with Him is more than enough to make a strong connection. But there certainly is more and it is profound. In the transfiguration account, Jesus is seen talking with Moses and Elijah. What is this about? Two questions actually occur. First, why of all the prophets, only Moses and Elijah? Second, why are they talking? The two questions are intimately related and point to the theological message of the transfiguration. To the question, why Moses? the answer seems clear. Moses is the quintessential Sinai prophet. If the story of the transfiguration alludes to Sinai, there can be no doubt that we are supposed to read the story of Moses and Jesus together. So, what happened at Sinai for Moses? To begin with, Moses and the three he led with him, Aaron, Nadab, and Abihu — this is not to mention Joshua and the elders who were also present — saw God on Mt Sinai (Exodus 24:9-11). Even more than this, after Israel sinned with the golden calf, Moses saw the glory of God revealed on Mt. Sinai (Exodus 33:18-34:7). There are two details associated with this that might easily be forgotten, though they are important. First, Moses twice fasted 40 days and 40 nights before he meet Yahweh on Sinai. Second, when Moses met Yahweh, he talked with Him “face to face” (Exodus 33:11). At the transfiguration, the greatest prophet of the old covenant era met Jesus face to face and talked with Him — a detail recorded in all three synoptics (Matthew 17:3; Mark 9:4; Luke 9:31). This brings us to Elijah. Why is he the other prophet with Moses? After all, there were many other prophets and some of them wrote important books of the Bible. What is it about Elijah that make him special? This is where the detail about fasting 40 days becomes important. 40 day fasts are not at all common in the Bible. In fact, they are quite rare. Apart from Moses, Elijah is the one other man in the Old Testament story that fasted 40 days and then met Yahweh on Mt. Sinai (1 Kings 19:7-18). This connects Moses and Elijah with each other and with the idea of meeting Yahweh on Mt. Sinai. The other detail — that Moses talked with Yahweh at Sinai — comes into play as well, for Elijah talked with Yahweh at Sinai. So, to summarize, there were two and only two prophets who fasted 40 days and then talked with Yahweh on Mt. Sinai — Moses and Elijah, the new Moses for his generation. These two prophet meet Jesus — the only other person in the Bible who fasted for 40 days — on a high mountain and when they met Him, His face was shining like the sun (Matthew 17:2). I suspect, it was very much like the glory of Yahweh that the two of them saw on Mt. Sinai many years before. The theological import of the complex allusion to Mt. Sinai and the two prophets who spoke there with God is clear. The Jesus who was transfigured before the eyes of Peter, James, and John was none other than the Creator God, the Covenant Lord, Yahweh. Moses and Elijah are seeing the glory of the same Person they saw long years before and they are talking to Him again about His coming “exodus” (Luke 9:31) — another allusion to the larger Sinai story. Matthew, Mark, and Luke, through this rich web of allusion declare in no uncertain terms that Jesus is the very Yahweh that met and spoke with Moses and Elijah on Mt. Sinai. Of course, Peter, James, and John did not get the point at the time of the transfiguration. Only after Pentecost and the gift of the Spirit would they be able to understand the overwhelming profundity of what they had experienced on the unnamed mountain. We may be assured, however, that Moses and Elijah recognized who they were speaking to. But did they comprehend what Jesus said about His exodus? Was the cross as much of a mystery to them as it was to the disciples?